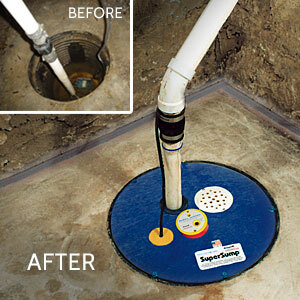 The SuperLiner sump pump basin from Basement Systems provides a clean, safe alternative to an open sump pit. An open or loosely covered sump pit is a safety hazard and a source of unpleasant odors. An open sump pit allows debris and pests to fall into the sump hole and potentially clog the pump's intake, increasing the risk of a flooded basement. The SuperLiner sump pump basin from Basement Systems is designed to securely hold the sump pump while providing a clean appearance. The SuperLiner, combined with our airtight sump pump lid, will keep odors, pests and radon gas out of the basement. 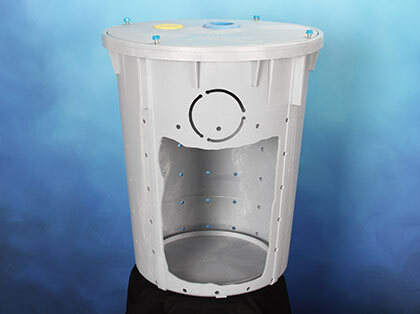 A one-way floor drain in the lid allows water from leaks to drain into the sump pit. Both the SuperLiner and sump pump cover are installed with every sump pump system sold by an authorized Basement Systems dealer. Basement Systems sump pump systems are available only from an authorized dealer. Call us today to request an in-home consultation and estimate with the expert installer in your area.